A circular walk around Arnside Knott in Lancashire. 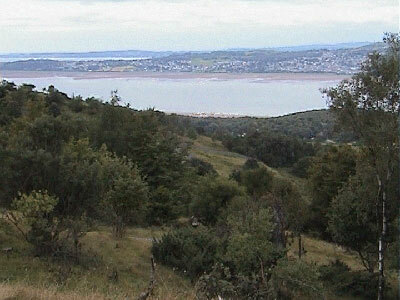 Arnside Knott is a haven for birds and wildlife with a mixture of Southern and Northern species on the edge of their ranges. From up on the Knott, many of the Lakeland Fells can be seen as indicated on the viewpoint indicator. Parking: National Trust Car Park (grid reference SD 449 773) on Arnside Knott. Just as the B5782 ends in Arnside, the continuation of this road bends round to the left and climbs up a hill. As the road starts to flatten, Arnside Knott is signed to the right. Follow the road round through a housing estate, then after about half a mile turn left up a road again following the sign for Arnside Knott. The National Trust car park is at the end of this track. Facilities / refreshments: Toilets, cafes and pubs near the start in Arnside. Arnside Knott is known for its wildlife and mixture of Southern and Northern species at the edge of their ranges, Travellers Joy and Southern Wood Ant meet Blue Moor Grass and Scotch Argos Butterfly. Woodland encloses many of the slopes on what was once open grazing land, as over the years the trees have colonised the area so that management work by the National Trust now involves the creation of sunny glades and the maintenance of a patchwork of habitats. South-west of the Knott is an extension of the limestone ridge called Heathwaite, a quite different mix of coppice, oak woodland, birch scrub, heath and pasture. Because much of Heathwaite has been continually grazed there are extensive communities of lime loving plants and the close cropped sward creates a mosaic of colourful flowers. On the higher ground there are fragments of ancient woodland with trees such as small leaved lime and wych elm. Go to the far end of the car park where there is a gate in the wall. Do not go through the gate but turn left and head up the path alongside the wall. After about thirty metres, this path meets a main track coming in from the left, which also comes from further up the car park. On meeting this track, turn right and go through the left-hand of the two wooden gates and continue straight ahead on the wide track under tree cover. After a further fifty metres go through another gate and continue ahead following the public bridleway sign for "Heathwaite and Arnside Tower". The path dips down before slowly climbing and turning around to the left just before it reaches a wall coming in from the right-hand side. Go through the next wooden gate and go straight on following the blue public bridleway sign for "Arnside Tower", ignoring the National Trust sign for "Heathwaite and Far Arnside" which goes off to the right. Continue ahead along the track through the woods. After about one hundred metres there is a turning off on the left which immediately goes through a wooden gate before heading uphill. Ignore this and carry on along the path, which is now heading slowly downhill. As the tree cover starts to become less dense and scree and loose stones appear on the left, through the trees on the right can be glimpsed a distant view of Ingleborough. As the tree cover above starts again to increase, pass through another wooden gate and continue ahead heading slightly downhill, ignoring the more minor path, which goes off immediately left uphill. Continue along this path until it begins to drop down to two gates that lead out onto a road. Twenty metres short of the road turn left off the path onto a less well defined path which starts to wind its way upwards through the trees. After about one hundred metres it meets a wider path coming in from the left. Turn right onto this path. To the left of the path here are areas of scree called Shilla slopes. The path slowly descends heading back down slowly towards the road, all the while keeping within the woods and the wall to the right. The path a few yards further on splits. Take the right-hand fork keeping near the wall, which immediately passes another gate, which is another access point to the road. Continue ahead on the path keeping near to the wall until the wall bends round at a right angle in front of you, where there is a gap through the wall. Ignore this gap and turn left following the line of the wall uphill heading away from the road, all the while still keeping the wall just to the right-hand side of you. The path now climbs at the side of the wall for a couple of hundred metres, under dense tree cover. It then momentarily diverts away from the wall to go around the left-hand side of a large tree. At this tree the path splits with the right-hand fork keeping by the side of the wall and heading on about forty metres ahead through a gate in the wall. Ignore this path, and take the left fork at the tree heading diagonally left away from the wall uphill. Looking up the path at this point grass can be seen about one hundred metres ahead where the path starts to leave the trees. The path winds and climbs over stones and tree roots, before emerging out of tree cover, here becoming more well defined as its bright white stones clash with the green grass. Continuing ahead ignoring any smaller paths that branch off to the left, the first views of the Kent Viaduct and estuary appear over the wall to the right-hand side. The path slowly closes in on the wall as the views start to improve. As the path starts momentarily leaves the wall by about two metres it splits, with the right-hand fork immediately going through a gate in the wall. Take the left fork away from the wall and almost immediately the full range of the Lakeland hills and the Kent estuary out to Morecambe Bay become visible over to the right. A further one hundred metres on the path passes a wooden bench set into two stone pillars. From here again there are excellent panoramic views from the sea, through the range of Lakeland hills all the way around to the Howgills. The stony path continues on past the bench on the very well defined path heading slightly downhill. As the path starts to steepen it bends around to the right where there is a view out to the sea on the left, then bends around to the left before continuing on back into tree cover. Thirty metres into the trees the path again splits, take the wide left-hand fork heading downhill. Continue down and as the path starts to leave tree cover, there is an excellent panoramic view down towards Morecambe Bay. As the path opens up and just before it swings sharply around to the left, there is a cut down tree stump in the middle of the path. To the right of this there is another smaller stump about two feet in height and to the right of that a wooden bench. Turn right here and take the gravel path heading slightly uphill which passes the bench. The path winds its way uphill across the grassy slope for about sixty metres before passing through a gap in a wall which crosses it, and then meets a much wider path. Turn right onto this path and head upwards for about forty metres where there are three small walls in which is inlaid a pictorial layout of all the hills which are visible ahead. Turn left here heading downhill initially crossing a twenty metre grassy pathless area, before joining a well defined stone path which leads back down onto the road which leads back into the car park. Just before it meets the road, there is another, this time wooden, pictorial of the hill profile visible in front. On it is shown the hill profile from Coniston Old Man across to: Crinkle Crags; Bow Fell; Glaramara; Gummer How; Skiddaw; Helvellyn; Fairfield; Red Screes all the way round to Harter Fell on the right-hand side. This wooden pictorial is about two metres short of the road. Go down onto the road, turn left and follow the road back the one hundred metres back into the car park.